Yahooooo for Diana and for the fab 5....a special woot woot for Lauren and Piali!!! Congrats to Diana and the FAB 5!!! Amazing, AMAAAAZING work all!!! Congratulations Diana! A truely beautiful card! And to the fab five....way to go! Hope you all can join us tomorrow for another fun week! i'm in the fab five?! TOO COOL, thank you! ♥♥♥ especially to be in *THAT* group of asstonishing cards, what an honor! congrats to diana, absolutely stunning work! NO WAY!!! I WON??!! OMG! Thank you so much Laura and Kazan! I am so honored to be the card of the week! And to the Fab 5....Incredible work! Thank you sooooo much!! Congrats to all of the winners!! Diana's card is amazing!! WOW!!! thank you Laura and 2S4Y DT!!! Fabulous card ladies...congrats to all winners!!! 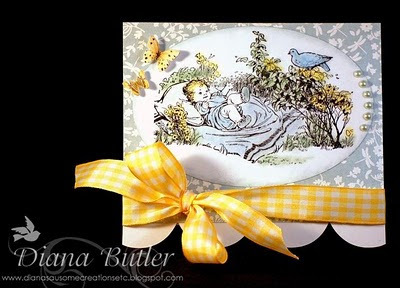 Wow the minute I visited Diana's blog I knew she had a fabulous card, that image and the way she used it had to be a winner!!! I am so honored to be in the fab 5, such awesome work from everyone. Congrats Diana and the Fab 5. Milly (Paper Boutique) i love your card. Great Job!